The Cuisinart CTG-00-SMB are versatile stainless steel mixing bowls nest to save space and have lids to leftovers in refrigerator or freezer. These are dishwasher and refrigerator safe. Size: 1.5 Qt., 3 Qt. & 5 Qt. The Stainless Steel 3pc Mixing Bowls With Lids has many exciting features for users of all types. See the Stainless Steel 3pc Mixing Bowls With Lids gallery images above for more product views. 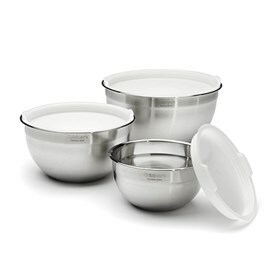 The Stainless Steel 3pc Mixing Bowls With Lids is sold as a Brand New Unopened Item.